The Combi all in one is a classic car-themed entertainment center that allows your child to stand, jump, and explore his surroundings. The mobile entertainer has a three-position height adjustment and functions as a walker with a lockable jumper feature. The electronic play tray features fun sounds, lights, mirrors, and toys to entertain and stimulate your little one. The car hood can be removed to create a large tray surface for snacks and drinks. ENTERTAINER, ACTIVITY WALKER, SNACK TRAY: The Combi Activity Baby Walker is a mobile entertainer that is truly an all in one Activity Center. When locked, your little one will bounce and jump for hours! Gliding around the house is hard work. The front hood snaps on and off providing your child with an ample surface for their snacks and drinks! AMPLE PLAY VALUE: The Combi Activity Baby Walker comes with its own "entertainment system"! 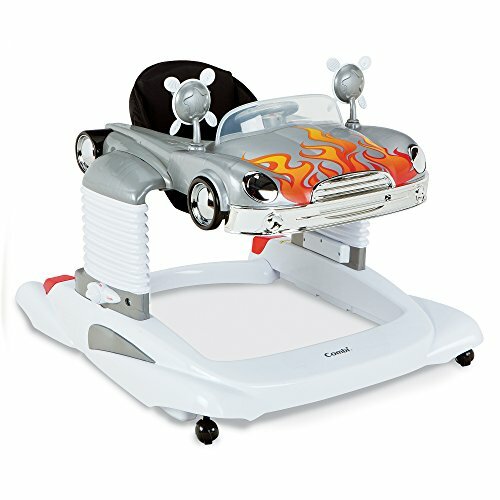 The removable electronic play tray provides hours of activity with lights, sounds, mirrors, and toys! Each toy aids with your child's cognitive development. Your child will love their first mobile activity center. This is their first ride, you want to make sure its 'fully loaded'. EASY TO ASSEMBLE: The Combi Activity Baby Walker is very easy to assemble straight out of the box. We want to get your child in their new rider as soon as possible. So Combi made it easy for you to assemble and get rolling. THREE POSITION HEIGHT: The Combi Activity Baby Walker has three different height positions to accommodate your growing child! Small or tall babies will love this walker! It is very easy to adjust both up and down. COMFORT: The ample padding in the seat pad allows gives your child a comfortable ride and jump seat. The seat pad is easy to take off and is machine washable.